With 14 Million Australian’s feeling the bulge, it is no surprise that many people are looking to lose weight, whether under doctor’s orders or just to look and feel healthier. However, have you ever stopped to think about where the weight goes when you lose it? 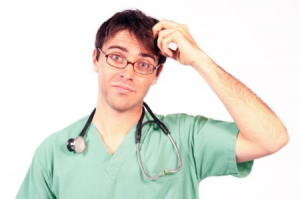 A recent survey of health professionals came up with all sorts of interesting answers, ranging from the loss of bodily fluids like sweat and urine, through to more solid waste products. Many felt it was converted to energy, but the First Law of Thermodynamics, states that energy must be conserved and cannot be created or destroyed. In fact, 98% of them got it wrong. So where does the weight go when you lose it? Yes, you heard right – when we lose weight, most of it is lost through our breath. This surprises just about everyone, but, almost everything we eat for energy comes back out via the lungs. All the carbohydrate you digest and nearly all the fats are converted to carbon dioxide and water. The same goes for alcohol- and protein if your body needs to use that for fuel. The reason this is important is that if we are not burning fat, we will not lose much weight. A healthy and efficient metabolism will burn fat most of the time and will flexibly shift in and out from burning carbohydrate to burning fat as circumstances demand (like a car changing gears going up and down hills) calling on our fat stores as needed and keeping us at a healthy weight. If we want to lose weight it is important that our body spends its time burning its own body reserves of fat. It might be useful to understand this to manage our metabolism and weight? Let’s look at this in more detail. When we talk about losing weight, we want to lose our body’s fat reserves and protect the muscle and lean mass that we have. Muscle is more metabolically active and therefore burns more fuel. Unfortunately, many diets, particularly those that that rely on cutting calories will see as much weight lost from lean tissue as fat, and this is one reason people often regain weight when they stop a diet. To understand how we lose fat, we first need to think about where the fat goes when we eat a normal meal containing carbohydrates, protein, and fats. While it is true that excess fluids, along with solid waste products are excreted and that all food is not digested, almost everything we eat, apart from dietary fibre, gets absorbed into the blood stream or organs and is either used directly as fuel or stored until required. We are not able to store much more than 1 days’ worth of glycogen (the storage form of glucose), but as our bulging waistlines can testify we can store plenty of fat (also known as adipose tissue), in the form of triglycerides, which is a substance made up of fatty acids, joined together by a glycerol molecule. When your body needs some energy, it uses another chemical (lipase) to break up the fatty acids and release them into your bloodstream. Conversely, when your body has an abundance of energy it stores it in response to hormones. When this process is out of balance, your adipose tissue fills up. If at maximum fat has to be stored somewhere and it ends up in places it was not intended. It should be like the ebb and flow of the tide, but when the tide is always in, we need to do something about it or our metabolic health will suffer. While our genes play a role, poor metabolic health is what many of us face. It is not a matter of having ‘unlucky genes’, a fatty liver or type two diabetes are two possible outcomes for almost everyone. Extracting energy from fat is known as beta-oxidation, which combines the fatty acids with oxygen– releasing energy for your cells and carbon dioxide as a by-product. The carbon dioxide is then exhaled, which means you really do breathe your fat away. “When somebody loses 10 kg of fat (triglyceride), 8.4 kg is exhaled as CO2. The remainder of the 28 kg total of CO2 produced is contributed by inhaled oxygen. Lungs are therefore the primary excretory organ for weight loss,” say researchers. The image below explains what happens when we combine the fuel from triglycerides with the oxygen we breath in to produce carbon dioxide and water which we breath out through the lungs. Given our body is designed to burn predominately fat, and losing fat is key to successful (long-term) weight loss, how do we know how much fat we’re burning and, what can we do to improve this? Today we can measure our gases using special technology called indirect calorimetry and this information can be used measure the metabolic health of patients and athletes. The breathing test, which is done at rest can identify whether your metabolism is Fast or Slow, whether you are generating energy from fats or sugars and how efficient the mitochondria (think of these as the ‘engine’ of our cells) are at converting the food components into fuel. Your exhaust gases can’t be assessed through special watches, gadgets and, most certainly not through scales; however researchers now realise this is key to long-term metabolic health improvements, like weight loss, and prevention or indeed reversal of type two diabetes. 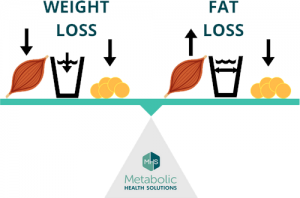 At Metabolic Health Solutions, our clinical weight management programs use indirect calorimetry to determine which fuels (i.e., glucose and fat), and how much of them, your body is burning. Through regular testing, these results enable our qualified health practitioners to provide you with personalised interventions to optimise your metabolic health and fuel usage (i.e., turn your fat-burning switch ON), to ensure long-term weight loss and improved health. 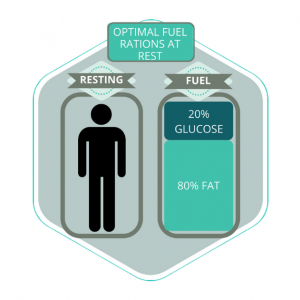 In summary, our bodies are designed to burn fat at rest so, get your metabolism right and you could be burning fat in your sleep! While we all know losing weight isn’t quite that easy and activity helps, it is good to know that we all don’t need to live inside an episode of “The Biggest Loser”. Unlike other approaches which use equations and guess work to inform your lifestyle choices, indirect calorimetry measures your metabolism! We are not all the same. Are you burning fat flexibly and efficiently, and if you are or not, what are the different strategies you can use to improve that? If you’re ready to answer that to optimise your metabolic health to help you reach your health and weight loss goals, contact our clinic today.